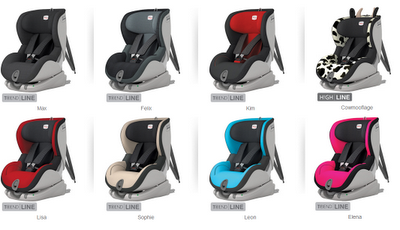 Back in April we were approched by Britax who were launching their latest car seat - the Britax TRIFIX. Dubbed "the safest and most beautifully engineered Group 1 car seat", it sounded fab and after taking a peek at it on the Britax website I was impressed by all of it's safety claims - not to mention it's modern look and sleek lines. I wrote back immediately to confirm that we would LOVE to road-test the TRIFIX -and that is what we have been doing for the past 3 months. 3 months, I feel is a long enough time to really get to grips with a carseat and it gives you enough time to pick up on any annoyances that in a couple of weeks might not necessarily come to light. Well to be honest car seat fitting is not my speciality so Chris took charge of "putting it in". Our car is a 54 plate Meriva and we had checked beforehand that the car seat was compatible with our particular car. After thoroughly reading the instructions he got to work. After locating the iso-fix bars between the seat cushions, Chris lined up the car seat arm hooks. At first he really struggled and we're not sure what was at fault (the car, the human or the seat) but he only seemed to be able to lock one of the iso-fix hooks rather than both hooks at the same time. As he hooked one on in the other hook would retract. This went on for about 10 very frustrating minutes before he eventually managed to fix both together. It's important to note that the TRIFIX cannot be fitted using the cars three point seatbelt. In fact, research shows that only 30% of car seats installed using an adult seat belt are installed correctly, compared to 96% when using the iso-fix system. The V-Tether system (shown left) was relatively easy to setup. One of the good things about this seat is that it has 2 special indicators - (1) to show that the iso-fix arm hooks are properly engaged and (2) to show that the V-Tether is pulled tight. It took Chris about 25 minutes in total to fit the seat and ensure that it was all safely fitted. Second Time Mummy Top Tip: It is a lot easier to fit a child's car seat when both front seats of the vehicle are as far forward as they will go. It allows the fitter maximum room to move and adjust the child seat in the back of the car. Prior to fitting the seat, we had Little E sit in it in the hall so that we could adjust the headrest and the harness to the correct height. A correctly adjusted headrest ensures optimal protection for your child in the safety seat and should be adjusted so that the shoulder straps are at the same level as your child's shoulders or slightly above. The seat is clearly comfortable - it has deep softly padded side cushions which are incorporated with uniquely designed SI-PADS. These SI-PADs are made of special energy adsorbing material which will protect your child from any side impact collisions by moving them away from the accident. Straps are key for me when choosing a car seat. I want my child to be safe and secure but comfortable at the same time. 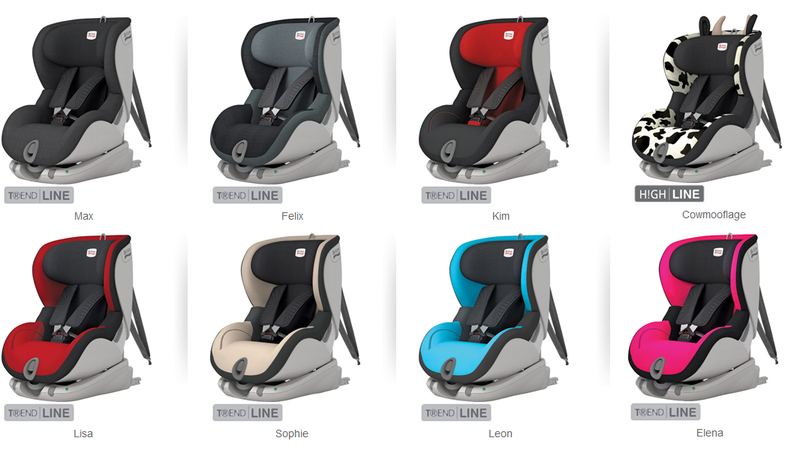 The straps on the TRIFIX were a real standout for me in comparison to previous car seats we have used. The TRIFIX has special 'perfomance chest pads' (see left) incorporated into the five-point safety harness - meaning, if an accident where to occur these pads will absorb forces felt by your child and further reduce forward movement. The straps, with thier flexbile high-density foam padding, allow your child to be tightly strapped in to the seat without cutting in to them or feeling too tight and uncomfortable. It's all very well having a comfy seat but if it's a nightmare getting your kids in and out then there's a big problem. One of my favourite features of the TRIFIX is that the main buckle remains permanantly upright saving me a lot of "fishing under bum time." My ultimate fear though is catching Little E's skin in the buckle and the TRIFIX doesn't solve this issue. If I could change the design in any way it would be to add some kind of leg protector to prevent any nasty accidents. There are multiple reclining positions available for when your little one is sleeping and I am pleased to say that you can adjust the position easily using the front lever - without it even waking your little one! We did still get a case of "drooping head" but I felt that Little E was a lot more supported than in her previous seat. The head rest is well padded and snug. In the past 3 months the TRIFIX has seen a lot of snoring from my little girl so I guess that's a pass. Great news.. you can remove AND wash the cover! There are full instructions provided but basically you just slide off the headrest cover and then the main seat cover comes off easily. Both covers can be safely washed at 30 degrees. The only part you cant wash is the shoulder pads as they are permanently attached to the harness. Finally, huge tick for Britax for realising the plus points of having a removable main buckle. This has been one of my major frustrations over the years when cleaning - you always get loads of crumbs and dust gathering in the nooks and crannies that is impossible to remove because of the buckle. You can never do a proper clean - not anymore! Hooray! The TRIFIX is currently available in 8 colours. The design is fabulously sleek and I've had a couple of "Oooh what's that car seat?" queries whilst chatting to mums in the nursery car park. It looks stunning and I only wish I could ride around in one! Mark Bennett, Britax’s Car Seat Safety expert remarks, ‘We are incredibly proud to be launching our safest Group 1 car seat. The advanced safety technologies form part of what Britax call 360 degrees protection – our commitment to keeping children safe from every possible angle of impact. We will continue to strive to develop and enhance all our seats to ensure peace of mind for all parents who choose Britax and optimal safety for their children. The original ISOFIX (which connects child car seats rigidly to the vehicle chassis) now an international standard for child seats in vehicles, was born by Britax in co-operation with VW in 1997 to combat the problems of poorly fitted car seats and improve child safety. Now, with the advent of ISOFIX + technologies used in the TRIFIX seat, parents can have the ultimate peace of mind knowing their child could not be any safer. 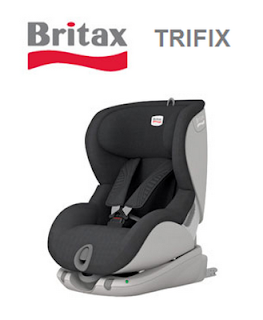 As well as being Britax’s safest child car seat for this age category, TRIFIX is simple to use. The ISOFIX system anchors the seat directly to the car’s ISOFIX connection points, while the V-Tether clicks into the third anchorage point in the rear of the car. Special indicators show parents that the ISOFIX catch arm hooks are properly engaged and that the V-Tether is pulled tight.In addition to this, there are some more practical, parent friendly enhancements; the seat cover is quick and easy to remove and wash, the buckle stays in the forward position so it is easy to sit your child in the seat, there are multiple recline positions for when your little one is sleeping and the ISOFIX arms retract neatly for easy storage. After 3 months with the TRIFIX we absolutely love it. It gives us piece of mind with all it's safety fetures, it looks great and Little E finds it comfortable enough to snooze in. Retailing at £319.99 I would have completely dimissed this seat as being out of budget but given that it can be used for 3 years - that works out at less than £10 per month over that time frame. Well worth it if you've got the money to spend up front. We think it's great and we're recommending it to all of you. The TRIFIX seat is suitable from 9 months to 4 years (or 9-18kgs) and retails at £319.99. Secontimemummy.com recieved a Britax TRIFAX carseat in order to post this review. However, this is not a sponsored post and all views are my own. 1. If every day tasks were Olympic events what would you get a gold medal in? Hmmm, washing without ironing (where possible). I'm sure you all do it - but if I put a clothing wash on, I hover nervously around the machine until the door clicks open and drag the clothes out as fast as I possibly can to avoid creases - if you hang them/tumble them in time then no iron is required. It's a fine art! 2. As a child (or now even) did you excel at a particular sport and if so which one? Er... no... not unless the sack race is a world recognised sport! In fact I was probably the worst in my year at any kind of track event - I remember my PE teacher saying I had a good arm for javelin once but that was a one off lesson! Maybe I could have made it if me and my arm had been nurtured. 3. Michael Phelps (swimmer) or Michael Johnson (runner) – which sport appeals to you more? Ooooh tough one, swimming is fun and the spinny thing they do in the water to turn (my knowledge of swimming as a sport is immense - can't you tell) has always fascinated me but for me it has to be track events. When I was about 10 years old one of my favourite things to do was run as fast as I could for 10 seconds and pretend I was winning the 100m. i love watching runners and I love the nervous feeling I get when Im watching the relay - eeek - dont drop the baton!! 4. How fast can you get out of bed and ready to go out the door if miss the alarm and sleep in? Unfortunately this is becoming a regular thing - but I can be out within 13 minutes provided the 'non-iron' event in question 1 has worked and I don't have a non-iron failure. 5. What fantasy sport would you like to see made into an Olympic event? 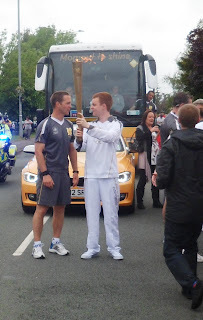 Oooh - getting the kids up and dressed in the morning - I train every day for this event - Im ready to win gold! 6. Claim to fame time – Have you ever met an Olympian and who was it? Hmmm, I saw Kriss Akabusi once at Manchester Airport in 1999 - does that count? 7. What event in past Olympics can you remember most vividly? I'm pretty sure I watched the whole of the Barcelona 1992 Olympics - I was 10, I'd race home from school and turn the TV on. I remember Sally Gunnell being my ultimate heroine when she won Gold in the hurdles and then she and the GBR team won bronze in the 4x400m relay. The men won bronze too - cue huge crush on Roger Black! Kriss Akabussi (my mate from the airport) won bronze in the hurdles and Linford Christie - well he won gold in the 100m!! Oooh and Chris Boardman won gold with that strange pointy helmet and Steve Redgrave and Matthew Pincent won the rowing. Amazing - I don't think we've ever done that well since! 8. Tuning in at home, not for me or tickets clamped ready in sweaty palms? 9. Who do you think most deserves a gold medal (any walk of life not just Olympians)? Parents - because we all have it tough and we plod on no matter how bad life gets. No matter how we feel we keep calm and carry on- because we know that our little people need us. If you are looking for some amazing personalised gifts then look no further than Merci Maman. I've been checking them out for Father's Day gifts and I'm really impressed. I find it really difficult to buy great presents and always try and opt for something a little bit different. There are some stunning pieces and we are lucky enough to give you the chance to win this fab engraved Men's Personalised Open Disc Bracelet. You can enter by using the Rafflecopter entry form below. 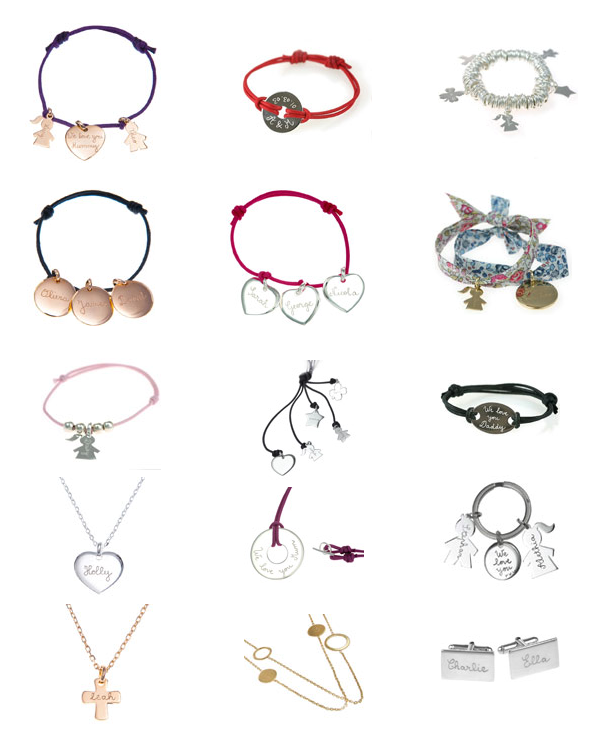 Merci Maman are taking orders for Father's Day orders until wednesday 13th June (for first class delivery) or until friday 15th for Next day delivery. Last night I felt an overwhelming sense of community spirit as everyone on our street came outside to put up their bunting up in anticipation of today's special arrival - The Olympic Flame. We feel so honoured to live on the torch route and this morning the flame came right past our house carried by Dan O'Hara (pictured). 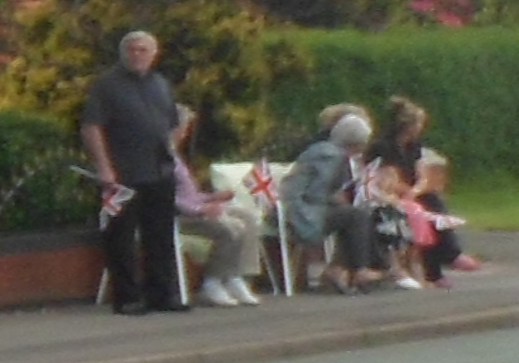 Everyone came out to line the streets - I loved that the older residents got their deck chairs out and sipped bucks fizz while they were waiting!